I wanted something stylish and unique so I started out with one of the coolest cloth chests in the game – Watcher’s Tunic – and built the rest of the set up from there. The pieces that make up this set come from a variety of sources so if you’re looking to put this one together, get ready to make a grand tour of Azeroth! Note that she is indeed wearing a shirt, Deckhand’s Shirt, to balance the deep cut of the tunic. The shirt is skin coloured so it’s very subtle in it’s appearance. 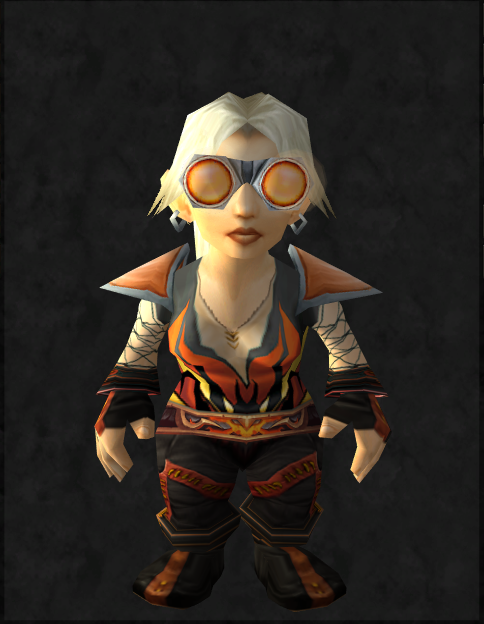 The sad news about this outfit for me, is that I’ve already long completed the quest that provides the chest on my main gnome. (In 6 years of playing, I’m bound to throw things away 🙂 ) So if I do manage to get this set, it would have to be on a new reroll and I’m honestly quite tempted to to it. 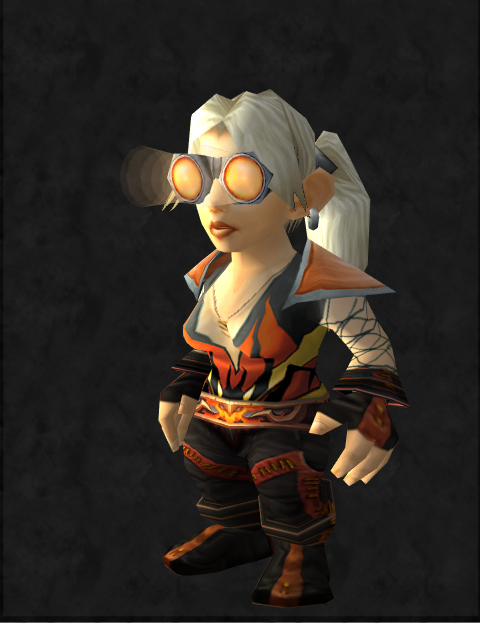 Although the goggles are so quintessentially gnome, I think this set also looks really good on a taller race like humans. 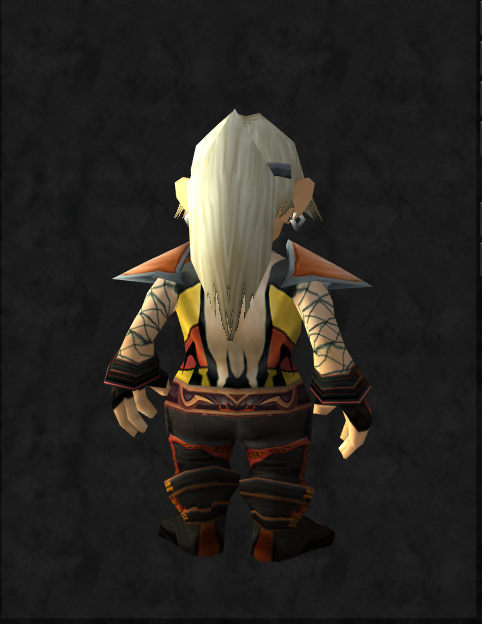 And frankly, it’s a lovely change from the usual robes and elegant shoulders priests have. I mean, who wouldn’t want their medic to look like this? This is a sweet looking outfit, just perfect for the Mechanohog! Love that top. 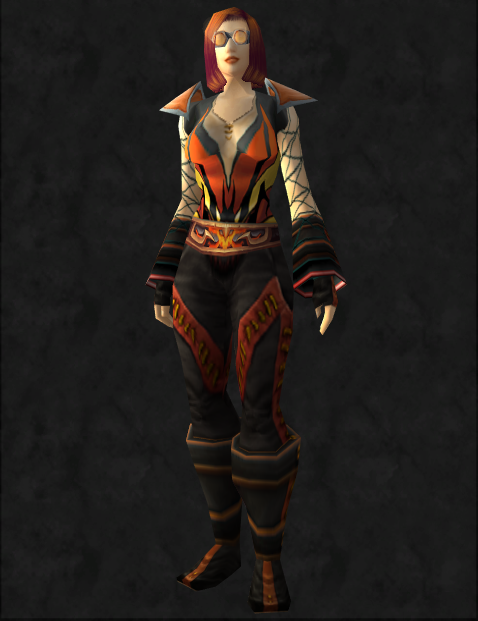 She looks awesome, ready to race ahead of any Goblin competition.